Glycolic acid corrects the skin by promoting cell desquamation. It assists in rejuvenation of environmentally and photo damaged skin along with correction of problematic and acneic skin. Most skin types will benefit from the use of a glycolic home regimen combined with a directed series of professional treatments. Result. This oil-free cleanser provides the skin with gentle exfoliation. Green tea and licorice extracts condition and tone. Can be used on most skin types. Glycolic Acid derived from natural sugars; a form of alpha-hydroxy acid, helps to exfoliate dull skin cells. Green tea leaf extract derived from the plant lead; antioxidant, protects from free-radical damage, known to reduce inﬂammation, repairs and strengthens. Licorice Extract is Known to reduce inﬂammation, brightening and clarifying. Revive. This facial tonic and treatment in one uses a unique complex of alpha Hydroxy acids, botanicals and Dead Sea salts to lightly tone the skin Containing witch hazel extract and aloe Vera enhancing the toning benefits. Aloa Vera Leaf Juice offers Refreshing, soothing, natural water-binding agent, antioxidant properties. Hamamelis Virginiana (Witch Hazel) Extract derived from bark and leaves; astringent, known to reduce inflammation, soothes, and heals. Vitamin C Improves tone and texture, potent antioxidant, exfoliates, brightens and revitalizes, can help speed production of collagen, non-irritating. Vitamin E is A natural moisture binder that allows the skin to breathe and function naturally, an antioxidant, improves moisturization, softness and smoothness, provides modest photo protection, helps by slowing the aging process. Sodium Hyaluronate is a humactant, regulating the level of hydration of skin; forms a moisturizing, non-occlusive layer of moisture on skin. Sea Salt (Dead Sea Salts) is from the Dead Sea; purifying, re-mineralizing. The source of balance. A hydrating cream masque with a generous amount of glycolic acid for optimal results. This gentle formula exfoliates and replenishes moisture to smooth fine lines and plump the skin. Licorice extract and vitamins A, C & E offer their benefits while sodium hyaluronate hydrates and softens the skin. 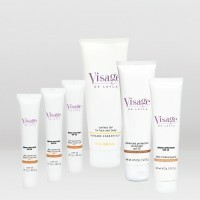 Retinyl Palmitate (Vitamin A) is a skin normalizer helping to balance the skin, a powerful anti-oxidant that increases skin elasticity, yielding younger-looking skin; an essential skin nutrient necessary for healthy skin maintenance and repair; moisturizes dry skin, reduces excess oil, smoothes and softens. Sodium Hyaluronate is a humectant, regulating the level of hydration of skin; forms a moisturizing, non-occlusive layer of moisture on skin. Radiate. This light, oil-free lotion formulated with 8.5% glycolic acid provides for a more robust exfoliation. Green tea and licorice tone and condition the skin, while hyaluronic acid adds essential hydration. Recommended for oily problematic and acneic skin types. Tea-Oil Leaf Extract is an Antioxidant extract is a rich source vitamins C and E; stimulating, anti-inﬂammatory properties; helps repair the effects of aging and environmental factors and promotes rejuvenation and elasticity. Hyaluronic Acid offers a Humectant, regulating the level of hydration of skin; forms a moisturizing, non-occlusive layer of moisture on skin. New you. For moderate exfoliation, this lightweight gel is formulated with glycolic acid to brighten the skin. Also beneficial for skin that is prone to acne. Glycolic Acid is derived from natural sugars; a form of alpha-hydroxy acid, helps to exfoliate dull skin cells. Orange Oil is derived from the fruit; aromatic essential oil, cleansing, rejuvenating, promotes cell renewal refreshing and soothing. Nurture your appearance. With an 8% AHA blend of glycolic, malic and lactic acids this lightweight serum offers moderate exfoliation. Squalane adds a whisper-thin layer of emolliency to the skin. Includes betaglucans and aloe Vera, vitamins A and E.
Glycolic Acid Derived from natural sugars; a form of alpha-hydroxy acid, helps to exfoliate dull skin. Lactic Acid is derived from fermented vegetables; exfoliates, refines and clears skin. Malic Acid is derived from apples and cherries; exfoliates, refines and clears skin. Vitamin E is a natural moisture binder that allows the skin to breathe and function. naturally, an antioxidant, improves moisturization, softness and smoothness, provides modest photo protection, helps by slowing the aging process. Yeast Betaglucan is an active ingredient in oats; promotes healing, stimulates collagen synthesis, promotes cellular turnover, protects and moisturizes the skin. Smooth as silk. A rich, moisturizing cream with 8% glycolic acid provides substantial exfoliation. Grape seed, licorice, and vitamin E calm the skin and provide antioxidant benefits, while vitamin A promotes healthy skin cells. Grape Fruit Extract is derived from the skin of the grape; nutrient rich emollient, antioxidant, rich in phenols, protects against damaging free radicals, anti-aging. Be the first to review “Renewal System” Click here to cancel reply.